Check out this Sacraments 101 video on the Sacrament of Baptism from BustedHalo. For Mass times, please check out our parish bulletins or our home page. The rite of reconciliation, often called "confession" is the sacrament in which Christ forgives our sins and reconciles us to our fellow Christians. Its sign or ceremony is the sinner's showing his sorrow by acknowledging his sins and the priest's words of forgiveness and reconciliation in Christ's name. Check out these inspiring video explanations about the Sacrament of Reconciliation. Sacraments 101: Why We Confess? Students enrolled in our CCD faith formation classes on Wednesday nights have the opportunity for confession during Advent and Lent. 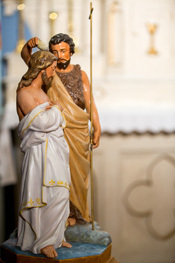 The Sacrament of Confirmation for the jr. high youth of Sacred Heart, St. Augustine and St. James occurs every 3 years. Preparation for the reception of the Sacrament will occur at least one year before Confirmation. The next celebration of the Sacrament of Confirmation will be in the fall of 2017 for the 7th, 8th, 9th grade students of 2017 2018 school year. Adults and young adults who have not yet received the Sacrament of Confirmation should contact the parish office. Confirmation for young adults and adults can be received in the Spring. Check out this clip from our Confirmation preparation video study series, CHOSEN from Ascension Press! So powerful! Come Holy Spirit! Video study series, BELOVED trailer found on Formed.org using our parish code (check our bulletin) from Augustine Institute. Other links to check out regarding Marriage and Family Life. Please take a minute to watch this short video on Natural Family Planning by clicking here. There are NFP classes in our area! Usually held at Sts. 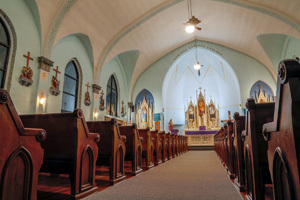 Peter and Paul Catholic Church in Seneca, KS on the 3rd Monday of each month at 7:00 p.m. Practitioner Susie Leuger teaches the Creighton Model FertilityCare method of NFP. Classes are for engaged or married couples and are introductory sessions that teach the participants the basics for using the method. After attending this class, couples may work with instructor for individualized follow-up. If you are preparing to receive the Sacrament of Marriage, please contact the Pastor at least 10-12 months before the wedding. POWERFUL testimonies of Fr. Mike Schmitz and Fr. Josh Johnson on their discernment into the priesthood. Check it out HERE. In an emergency or serious illness if sick and confined to a home, entering a hospital or local nursing home, please notify the office. Check out this well done video about the Sacrament of the Sick by clicking HERE.